To a greater extent than his Dutch contemporaries Rembrandt (1606-1669) devoted himself to the depiction of biblical stories. While his Calvinistic colleagues specialized in landscapes, still lifes and genre pieces, his Catholic contemporaries like Jan Steen did render biblical subjects, but limited themselves to themes sanctioned by tradition. Rembrandt, however, also chose subjects that fell outside the traditional canon. When he did select a standard theme, he often portrayed it in a unique manner. 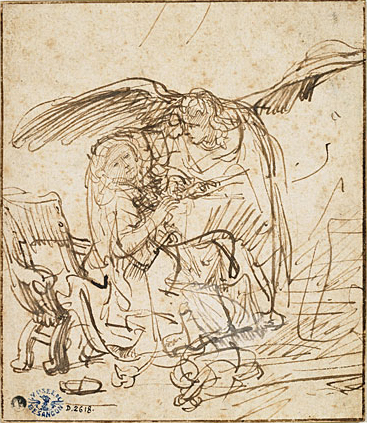 The latter is the case in the drawing of the Annunciation, which he made in 1635. The Annunciation is the visual representation of Luke 1:26-35. Over the course of the history of painting it has been a beloved and major theme as it depicts an important dogma: God becoming human in Jesus of Nazareth. There are a number of elements that traditionally are part of the depiction of this theme: Gabriel approaches Mary from the left, who is reading the Bible, opened at a particular passage in Isaiah. Reverently the angel draws near to Mary, sometimes kneeling down before her. Mary for her part also bows reverentially to the angel. Another standard element is the dove descending along a ray of light towards Mary’s breast. Sometimes, however, the ray enters her ear, as Christ is the Word. At times a baby is depicted in this ray of light with or without a cross in his tiny hands. This is how the moment of conception found expression. Let’s look at how Rembrandt renders this moment. It is immediately clear that little is left of the customary rendition of this theme. The angel approaches Mary from the right and there is no dove. At first sight the drawing makes a rather messy impression with a lot of unclear scribbling. The meeting of the angel and Mary is here far from a serene and elevated scene with figures bowing towards each other, but rather a chaotic and emotional spectacle. Gabriel, as we can see from the flowing lines behind him, has flown into the room at full speed. He bends carefully over Mary and looks at her filled with concern. His left wing is only partly depicted; the paper was too small to contain his imposing presence. Mary is totally overwhelmed by his entrance. She slides down from her chair, while her left arm seeks the support of the left arm of the angel and her right arm hangs aimlessly in the air. The book glides down from her lap. You need to look very carefully to make out all of this, as the space in front of Mary’s upper body is filled with an indistinct tangle of lines. What happens there is after all a great mystery. Mary’s face, full of shadow lines, is dark with emotion. Or is this a reference to Luke 1:35: ‘The Holy Spirit will come upon you, and the power of the Most High will overshadow you’? But there is more. Rembrandt makes use here of the formula, often occurring in 17th-century art, of the woman in danger, which shows the woman from aside in a sitting position (in fact Mary floats here in an impossible position between heaven and earth). This formula Rembrandt for instance also employed in his renderings of the bathing Bathsheba and Susanna – both women in danger due to the threat of being overpowered by a man. Mary is also a woman in danger here, says Rembrandt, due to the overshadowing by the power of the Most High, which will moreover lead to a life full of suffering. By the way, the one on whose account she will suffer, the baby, seems to shoot across the ground in the middle at the bottom of the drawing. Also the empty slipper in the foreground on the left is worth noting. Such a slipper often hints to bed scenes in Dutch 17th-century art, but it could also point to Moses, who had to take off his shoes at the burning bush. We may well say that we are standing on holy ground here! Thus we see that Rembrandt has placed his unique accents while depicting this well-known theme. The humanity of Mary’s reaction for instance suggests that she is not a saint who towers high above us, but through and through a woman of flesh and blood. Rembrandt moreover has emphasized the majestic appearance of the angel and the incomprehensible grandeur of what is taking place here. But perhaps the most special element in this drawing is the great care of the angel for Mary, his tender gaze of concern while bending towards her, spreading his wing over her head to protect and bless her. For even though we may receive impossible callings, and even though we are people in danger, whoever abides in the shadow of the Almighty he will surely shelter under his wings. Rembrandt van Rijn: The Annunciation, ca. 1635. Drawing with pen and ink, 14,4 x 12,4 cm. Musée des Beaux-Arts, Besançon.